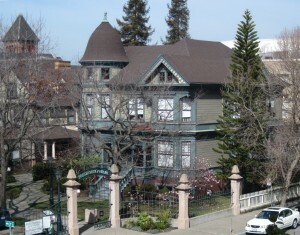 Founded in 1987, the Pacific Institute is housed in this Oakland, California Victorian. We are located at 654 13th Street (off of Martin Luther King Jr. Way) in Preservation Park, downtown Oakland California, 94612. We are the first Victorian house on your right as you enter through the main Preservation Park gate on MLK Way. Walking directions from City Center BART station: Take the “13th Street” exit from the platform and exit to the west. Ascend a series of escalators to the City Center mall and walk northwest (towards the twin spires). Cross Clay Street and walk through the lobby of the Oakland Federal Building. Cross Jefferson Street and walk one more block (there is a parking lot on your left), then cross Martin Luther King Jr. Way to enter the gates of Preservation Park. From San Francisco to City Center BART: Board either a Richmond or Pittsburg/Bay Point train (east-bound) and exit at the 12th Street/City Center station. See above for walking directions. From San Jose and points south to City Center BART: Board a Richmond train (north-bound) and exit at the 12th Street/City Center BART station. See above for walking directions. From Berkeley and points north to City Center BART: Board a Richmond-Fremont or Richmond-Daly City train (south-bound) and exit at the 12th Street/City Center BART station. See above for walking directions. Driving directions from Interstate 980: Exit I-980 at the 18th Street/14th Street exit. Continue straight onto Brush Street, proceed 4 blocks and then take a left onto 14th Street/International Drive. Cross the freeway, proceed one block and turn right onto Martin Luther King Jr. Way. There is metered street parking along Martin Luther King Jr. Way and a large, multi-story pay parking lot on your left just past the gates of Preservation Park. From San Francisco via car: Take I-80 East over the Bay Bridge. Merge onto I-580 East/Downtown Oakland towards Hayward-Stockton (2nd exit after the bridge). Then take the I-980 exit towards Downtown Oakland. Continue 1 mile to 18th Street/14th Street exit. See above for local directions. From Berkeley or nearby via car: Take the CA-24 WEST ramp towards Downtown Oakland and merge onto I-980 West. See above for local directions. From Sacramento or points north: From points north of Berkeley, take I-80 West to I-980 West. See above for local directions. From San Jose or points south via car: Take I-880 North just over 35 miles to the I-980 East exit. Continue briefly on I-980 East and take the 18th Street/14th Street exit. See above for local directions.